By taking lists of potential side effects out of the hands of the drug makers, the startup is letting people know what their pills might be doing to them in a more open way than big pharmaceutical companies ever have. Last week during a Republican debate, as you may have heard, Michele Bachmann claimed that the HPV vaccine Gardasil can cause mental retardation. 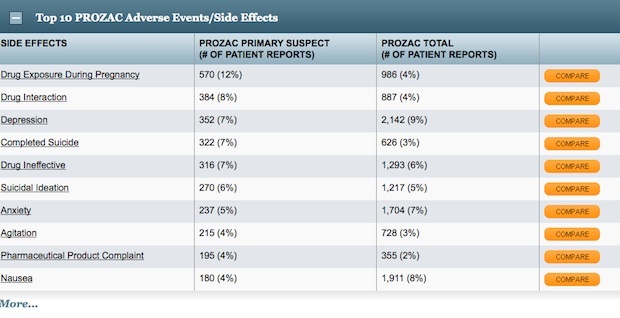 Prozac and other antidepressants are often linked to suicide. Ambien is rumored to cause amnesia in some patients. Which of these things are true? And how could we ever really know since the list of side effects that comes with medication never gives detailed statistics? “The FDA has some of this [side effect] data, but it’s unstructured, not searchable, and not standardized,” explains Overstreet. AdverseEvent’s proprietary algorithm, which took 18 months to build, takes into account data from the FDA, direct patient reporting, and even information from social media sites (AdverseEvents analysts are alerted to side effect discussions on patient discussion boards, for example, and try to extract data). AdverseEvents also has an internal alert system, so that the company can track potentially dangerous side effects and alert the FDA if necessary. the conversation,” says Overstreet. Fast Company contacted Pfizer for comment, but we have not yet heard back. AdverseEvents went live this month. It’s free for patients, but the startup has a subscription based model for insurance companies, hospitals, and eventually pharmaceutical companies. AdverseEvents is also working on a mobile app.